On June 19, in Nantes, took place the 2nd edition of the Meeting of Franco-German Business Clubs of Greater West, all members of a binational business network, gathering in large German and French cities people interested in reciprocal trade. 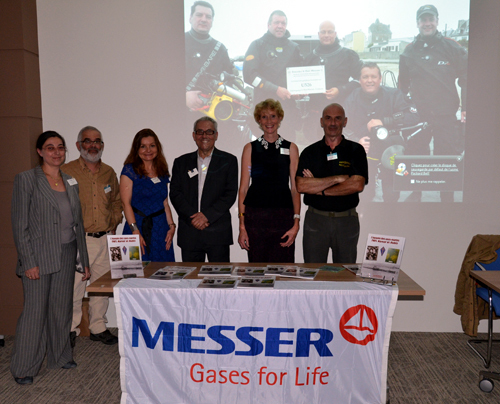 The event was organized by Cafana in Nantes and the largest privately managed industrial gases specialist Messer. Among them were the club Cafa Rennes-Bretagne from Rennes and l'Expédition Scyllias which conducted a panel discussion dealing with contemporary shipwrecks. 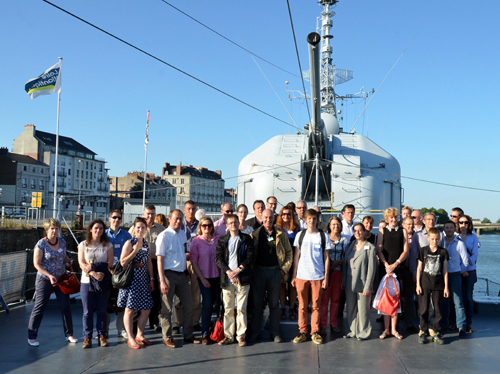 The meeting bringing together about fifty German and French participants, began with the visit of the T 47-class destroyer ("escorteur d'escadre") of the French Navy Maillé-Brezé, nowadays a remarkable naval museum in Nantes. The second part took place in the Chamber of Commerce and Industry which had made available its exhibition hall, where Messer exposed underwater photographs taken by l'Expedition Scyllias team, and a beautiful room where took place the conference evoking German shipwrecks of the Second World War and the Franco-German underwater operations already achieved or planned. During this historical subject, reference was made to offensive operations at sea and especially those conducted by U-Boote following the Allied landings on 6 June 1944, attacks that eventually ended, for many, to their loss and laid the foundations of the memorial and historical efforts by l'Expedition Scyllias team and their German friends in Taucher Gruppe U-Boot-Archi. The Breton team represented by Alain Vincent Gautron and Jean-Louis Maurette, exposed in front of a seduced audience the fates of several submersibles such as U 767, U 526 and U 171 and the discoveries of the wrecks of UJ 1420 and UJ 1421, both submarines chasers. Underwater photographs and videos allowed viewers to get an idea of the bad and very difficult diving conditions sometimes encountered on some deep wrecks and to have a better understanding of the specific techniques employed. This panel discussion continued with "a toast to friendship" during which participants could exchange ideas and discuss. This meeting helped to highlight the deep and strong Franco-German friendship but not always obvious in these difficult times when the economy and politics get involved. This kind of meeting, addressing a even sensitive subject, is an example of the unifying role of wreckdiving and can only strengthen relations between both countries. A big thank you to Angélique Rénier, communications Manager for Messer France, Cécile Gerdaoui and Dorothea Schmidt-Sellier, co-Chairs of the Franco-German Business Club Nantes Atlantique. From left to right : Cécile Gerdaoui, Alain Vincent Gautron, Angélique Rénier, Jean-Claude Bruchet (Chairman of Cafa Rennes-Bretagne), Dorothea Schmidt-Sellier and Jean-Louis Maurette.